In a small bowl, mix cornstarch with 2 tablespoons water; stir into berries in pan. Add lemon zest and juice, sugar, and salt. Bring to a boil; reduce heat. Simmer, stirring, just until mixture begins to thicken, 30 to 60 seconds. Remove from heat. Stir in remaining 3 1/2 cups fresh berries. 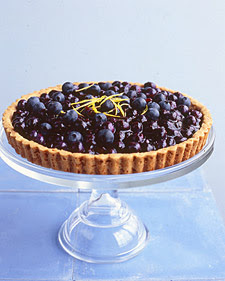 Immediately pour hot berry mixture into cooled tart shell, and smooth with a spatula.